Black and Hispanic Texans, low-income people and residents of the Beaumont and Rockport areas were more likely than others to have felt the negative effects of the storm, according to a survey by the Kaiser Family Foundation and Episcopal Health Foundation released Tuesday. Three months after Hurricane Harvey, 11 percent of Texas Gulf Coast residents said they were still displaced and 33 percent said they had been late on rent or mortgage payments, according to a new survey published Tuesday by the Kaiser Family Foundation and the Episcopal Health Foundation. Uncertainty is the new normal for Yashica Foster, who has been staying in a hotel paid for by FEMA for the past two months while she looks for a permanent housing solution. "It's taking a long time and not knowing what the outcome is going to be is nerve-wracking," Foster said. "We can't do anything but wait." Financial and housing issues are the two biggest challenges Harvey victims are still struggling with three months after the hurricane, the survey said. Over 40 percent of Texas Gulf Coast residents say their homes were damaged by Hurricane Harvey, and almost half say someone in their family lost work or income due to the storm. The survey was based on interviews conducted between Oct. 17 and Nov. 20 with 1,635 residents of 24 counties that are home to more than 90 percent of the population affected by the storm. The sample is representative of the region's demographics and the margin of error is plus or minus 3 percentage points. Hurricane Harvey hit the Texas Gulf Coast in late August, bringing more than 50 inches of rain and leaving unprecedented flooding and destruction along its path. More than 80 people died and 60 counties remain in a state of disaster, according to Gov. Greg Abbott's office. Among the survey's findings: 37 percent of respondents said they had to leave their homes during Harvey, 21 percent had their cars damaged and 13 percent said the health of someone in their home has worsened because of the storm. All three happened to Cinnamon Perry, 45, who lives in Winnie, a 3,200-resident town 30 miles southwest of Beaumont. After spending a month in a hotel paid for by FEMA, Perry and her two sons couldn't afford to rent a new house, so they returned to their moldy home. Now, they wake up to scratchy throats and burning noses every day, she said. "I can't breathe and they don't care," Perry said of state and federal officials. "My health just keeps getting worse. I told my kids: When it kills me, you sue FEMA and the state of Texas because they ain't doing nothing to help us." Perry says FEMA gave her family a little over $400 for home repairs and $2,000 for rental assistance, which she used to fix the well on her property and regain access to running water. The family also had to tap their savings to buy a new car, since the storm ruined the two they had. "Some days I can't even leave my home because I'm so frustrated and so upset that they are making us live like dogs. Worse than dogs," Perry said. According to the survey, among the 26 percent of respondents who said they have returned home, 32 percent said they did so before it was safe. The survey also found that the storm's impact wasn't felt equally along the Texas Gulf Coast. In Harris County, 38 percent of residents said their home was damaged. Meanwhile, the same was true for 62 percent of people living in the Beaumont, Orange and Port Arthur areas and for 64 percent of those living along the coast from Rockport to Corpus Christi. On top of the geographic disparities, the study authors also found that the storm's impact was comparatively more intense for people of color and those with lower incomes. Seventy-nine percent of Hispanic respondents said their homes or vehicles were damaged or that they lost work or income, compared to 73 percent of black respondents and 55 percent of white respondents. 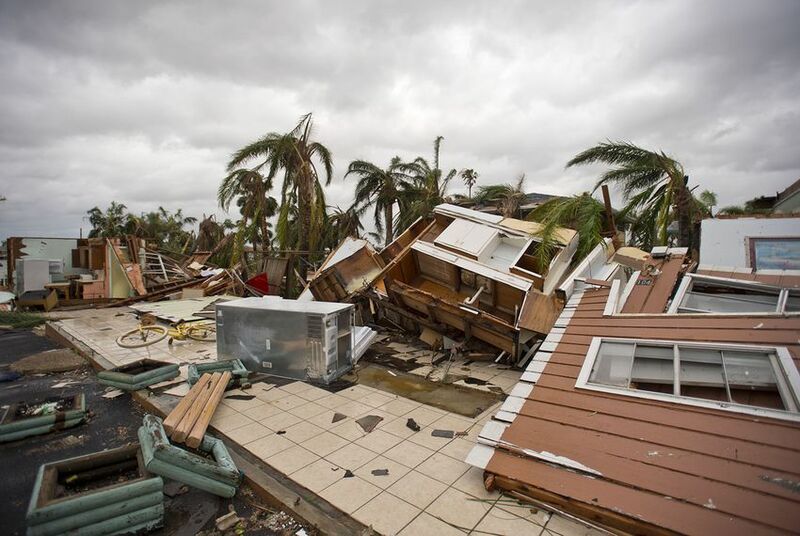 And while 52 percent of white respondents said they are getting they help they need to recover from the storm, 46 percent of Hispanic respondents and 32 percent of black respondents said the same. The study also shows that black, Hispanic and lower-income people were less likely to report having insurance and more likely to say they have lost a job or income due to Harvey. Elena Marks, CEO of the Episcopal Health Foundation, the organization that conducted the survey, said that in terms of race and income, pre-existing inequities persist through a disaster, making it harder for people of color and those who earn less to recover. "What has happened in Harvey is a mirror of what happens all the time," Marks said. That's the case for Houston resident Yashica Foster, an African-American mother who is struggling to find a new rental home where she can get her family back together. Foster, her husband and their oldest daughter are staying at a hotel paid for by FEMA, while the two youngest children are staying with friends and family so they are closer to school. The Fosters didn't have renters insurance and they are now hoping family members can help them pay the security deposit for a new lease. Her application for property damage assistance from FEMA is still pending. "I haven't gotten the help that I really really need, but I'm hoping that it's coming. It's just taking a long time," she said. Residents' trust in the allocation of recovery funds is fairly high. Six in 10 Gulf Coast residents say they are confident that the money being spent on hurricane relief will reach those who need it the most. In the survey, respondents gave generally favorable marks to local and state officials, saying 75 percent and 72 percent, respectively, were doing a good job. That's compared to their 46 percent approval rating of Congress and 43 percent approval of President Donald Trump's response to the storm. Half of respondents said Trump was doing either a "fair" or "poor" job. While Texas and federal officials are still working to estimate how much damage Harvey did to Texas homes, the authors hope the study will help officials get a better sense of what kind of assistance people need and which regions were most affected. "The reason we did this survey was because we feel that there's a lot of money — government money and private philanthropy — that will be going out the door. If people don't have multiple data points, how can they make good decisions about how to spend the money?" Marks said. Disclosure: The Episcopal Health Foundation has been a financial supporter of The Texas Tribune. A complete list of Tribune donors and sponsors is available here. Correction: An earlier version of this story incorrectly named one of the organizations that conducted the study. It is the Kaiser Family Foundation.